Brand South Africa continuously aims to encourage all South Africans to play their part towards progressive change, that promotes a free and fair society for all, through the #IAM campaign. In the State of the Nation Address, President Ramaphosa, emphasized the importance of a collective responsibility as a nation, as the people of South Africa to work to end the scourge of gender-based violence and femicide. “Government will lead the campaign to include men and boys as active champions in the struggle against gender-based violence. As government we continue to roll-out interventions to address social ills tearing our communities apart”, said President Ramaphosa. Brand South Africa’s General Manager for Marketing, Ms Sithembile Ntombela said, “This epidemic has been reoccurring and refuses to go away. Brand South Africa has committed itself to continue with a campaign that acts as a reminder that this is not who we are as South Africa. This behaviour does not represent our ethos as a nation built on the values of Ubuntu”. Encourage all South Africans to be active participants in the fight to eradicate violence against women and children. Expand accountability beyond the Justice, Crime Prevention and Security (JCPS) cluster to include all the citizens of the country. The campaign calls on men of diverse ethnicity to participate. Filmed with individuals in black t-shirts, wearing red lipstick with the words #IAM highlighting their role of protecting women and children. 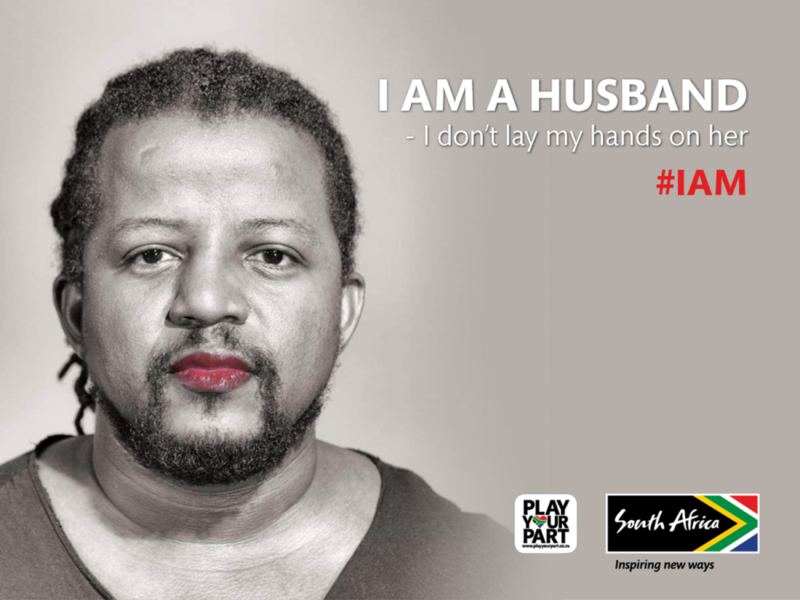 The #IAM campaign videos will also air on television screens and to participate in discussion follow #IAM and @Brand_SA @PlayYourPartSA on social media platforms. Call the Stop Gender-Based Violence helpline (0800 150 150).